Of all the wonderful players who have worn the crimson and blue for the University of Kansas basketball program through the years, only one can claim to be the “winningest” Jayhawk of all – Tyrel Reed. Reed, who concluded his playing career in March 2011, has written a new book that chronicles his time with the Jayhawks – Reed All About It: Driven to Be a Jayhawk. The book published by Ascend Books of Overland Park, Kansas, is co-written by long-time Topeka Capital Journal Sports Columnist Tully Corcoran. Reed was a champion on the court – as part of the Jayhawks’ National Championship in 2008 – and in the classroom, as a three-time Academic All-Big 12 First Team member. He was part of more wins than any other player in the storied history of the Kansas program. The son of a coach from Burlington, Kansas, Reed developed into an important leader and “glue guy” for the Jayhawks. He was an excellent outside shooter, sinking 170 three-point field goals in his career, and a clutch free throw shooter, with an .810 success rate. In his book, Reed describes what it was like to play for Coach Bill Self, how the game has changed with “one-and-done” freshmen players, and how he was able to excel academically despite the demands of basketball practice and road trips. 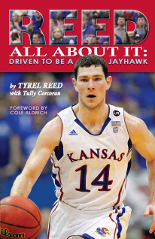 Told with heart and good humor, Reed All About It: Driven to Be a Jayhawk, is a must-read for any fan of college basketball. All-Big 12 First Team member. As a Jayhawk, he was part of one NCAA National Championship, one NCAA Elite Eight, two NCAA Sweet 16s, four Big 12 regular-season titles, and three Big 12 Tournament championships. He was part of more wins than any individual Jayhawk in school history. Tyrel graduated in 3.5 years. He is planning on continuing to play basketball professionally and he has also been accepted to KU’s medical school to study physical therapy. Tully Corcoran a columnist for Fox Sports Houston, has a long-time Kansas connection. years while on staff at the Topeka Capital-Journal. He covered Tyrel Reed’s entire career at KU. His work has been honored multiple times by the Kansas Press Association.